Roscoe is a very happy, one-year-old Pitbull Mix puppy who is looking for a forever home in Los Angeles. 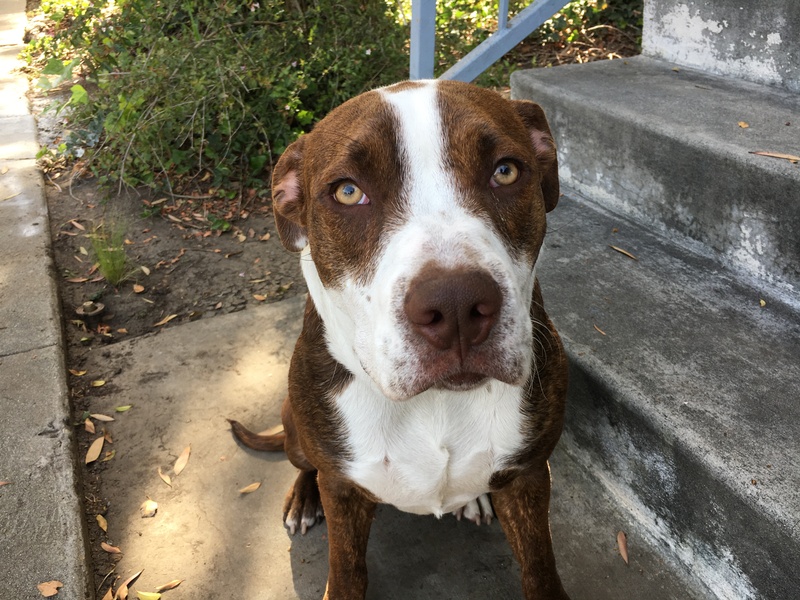 His foster guardian in Mar Vista set up a dog behavior training appointment to help with a few minor issues; excited urination, mouthing, stealing items, fear of unknown noises and reactivity to some big dogs who try to dominate him. As soon as the door opened, I was struck by this rescue dog’s playful personality and medium energy. He was clearly happy to make a new friend and had a delightful wiggle as he welcomed me into his home. Pitbulls have a bit of an unflattering and inaccurate reputation and Roscoe’s guardian wanted to make sure there were no dog behavior problems that may prevent him from being adopted and finding a loving forever home. Its awesome that a foster parent would be willing to hire a dog behavior expert to work with a dog who will become someone else’s, but I have found that some pretty special people foster dogs and Roscoe’s foster guardian is no exception. We chatted about the few issues Roscoe had and I made some suggestions that should help make him even more adoptable. I also went over some exercises to help him learn how to focus, teach him to drop, how to establish a boundary as well as some tips to stop his occasional mouthing. Adding rules and structure should help stop Roscoe’s excited urination. Waiting for him to be calm before petting him will go a long ways with this issue. For these reasons, I recommended his guardian introduce some rules and boundaries to provide additional structure and start petting him with a purpose. We also went out for a short walk after I shared some leash training tips and how to conduct what I call a structured walk. We used a Martingale collar and the special twist of the leash to help his handler lead him more effectively. To help Roscoe be at ease when it comes to some sounds he is fearful or or reactive to (Garbage trucks, construction sounds, etc), I went over the principles of counterconditioning. Unfortunately it was not garbage day and the one construction site we found on our walk was not manned, so I wanted to include this link so the foster guardian and Roscoe’s future family can apply this technique if needed. One thing I neglected to go over with his guardian was how she can add structure to meal time. Dogs spend 90% of their time in the wild looking for food so its a pretty important activity for dogs. Since they eat in order of their rank, adding a little structure to this daily activity can go a long ways towards helping the dog develop more respect for his humans. By the end of the session, Roscoe had shown a marked improvement on the few behavior issues he had. He was sitting to ask him guardian for attention, was showing respect for her personal space, walked with a loose leash in an almost perfect heel with his guardian and was already following the new rules we just introduced. This is one smart dog with a real desire to please his human. I was really smitten with how warm, loving and eager to please he was. Smart pup too. He caught on to things right away. If you are looking for a friendly dog with a great personality and energy, Roscoe is available for adoption through Pawsport Rescue. You can find their contact information on this page if you would like to meet him or get additional information on this friendly puppy. If you do adopt Roscoe, I will be here to support you so you would get a friendly, loyal and happy dog with backup by LA’s best dog behaviorist, lol. We wrapped up the session by filming Roscoe’s roadmap to success which you can watch by clicking on the video below.